PayrollPanda — How to add overtime? Help Center Home App How to add overtime? Overtime is an amount of additional salary given to an employee for working over and above their contractual hours. We set up several payroll items, Automated Overtime Payroll Items which automatically calculate OT based on hourly wages times the OT multiplier, and Manual Overtime Payroll Items which allow you to either add the total amount manually (lump sum) or calculate the wage based on the hours/days you key in. You will find all payroll items under +Additional Payroll Item > Remuneration. Note: If the OT payroll item is non-recurring, you may add it in Step 1 of running payroll. If an employee gets a similar amount of OT on a monthly basis (recurring), the OT payroll items should be added under Employees > Select Employee > Employment Details > + Monthly Recurring Payroll Item. 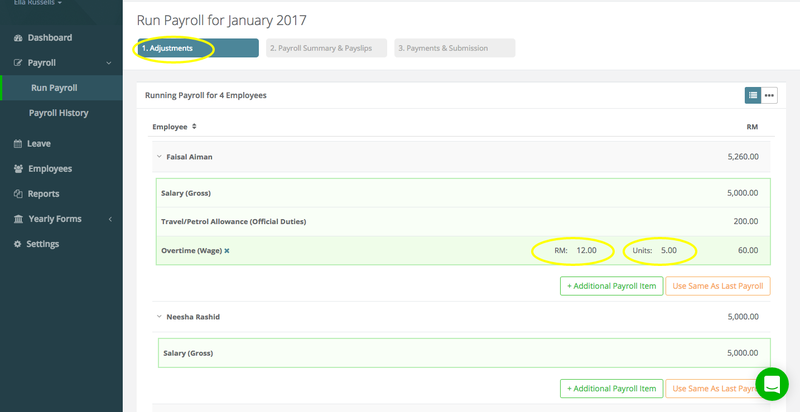 Leave the unit/hours field set to 0 and you can then enter the hours/days accordingly when running payroll every month. See our Help Article for further info on recurring/non-recurring payroll items. You can also create Custom Overtime Payroll Items that allow you to set your own OT rate for auto-calculations, see this Help Article to learn how to set these up. Overtime: You can enter the lump sum overtime amount for each employee. Overtime (Wage): You can enter the number of hours/days that the employee worked extra and the overtime rate. Unit is the hours/days based on your company's preference, while rate is the RM value of one hour or day of OT work.